Ray the Blind Dog: Hey! That's MY seat! It was late Sunday afternoon. 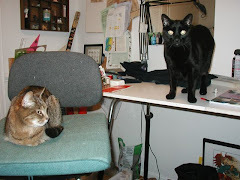 We'd been busy all day and I was more than ready to sit down and do some knitting. I gathered supplies and dropped them on the end of the couch, then collected all the stray newspapers to throw in the recycle pile. By the time I got back to the couch, Ray was there doing his usual nesting maneuver. He was digging and digging at the throw that I had draped over the cushions. (I think it offends him that I cover the couch.) I waited and watched until he was done. Usually, he curls himself into a tight little ball so that there's still room for me to sit down. But not this time. Ray stretched himself out the entire length of the couch then 'looked' in my direction. I swear there was a smirk on his face. Roxy sleeps with us. If I get up during the middle of the night, she moves into my warm spot. when I move her she growls! Don't our "kids" know who feeds them!